What is the main advantage of SmartGrass over natural turf? No watering. No mowing. Due to water restrictions across most of Australia, brown or dead lawns are commonplace. With SmartGrass, though, you can have a lush, green lawn all year and be the envy of everyone around you. How is SmartGrass different from other synthetic turf? 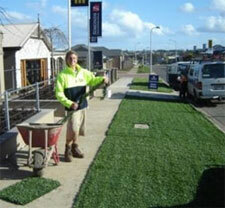 Our turf fibres have been manufactured to resemble real grass. The turf fibres have been curled and spring-set to help prevent “matting” over time. We also have a secondary fibre to bind the infill onto the base of the grass to prevent wash-out in the event of heavy rain. The combination of these fibres, our stitch rate and stitch gauge gives us the heaviest, densest face weight of fibre on the market (2.9kg per square metre). The fibre component consists of UV protected “polyethylene,” which is the softest fibre component in the industry. There has been extensive research and development to get these advanced fibres to the point they are today. Where can SmartGrass be installed? Anywhere natural grass can grow and most places where natural grass won’t grow. All you need is a compacted base that will allow the rainwater to seep into the ground through the backing of the grass. With ‘Water Harvesting’ in mind, you can shape the compacted base in such a way that any excess water will drain off the lawn onto your garden beds or into an underground rainwater tank. 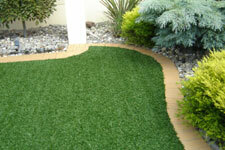 What preparation is required to install SmartGrass? The area will be cleared to a depth of approximately 80-100mm, filled with fine crushed rock and then compacted down to a flat surface. SmartGrass have qualified installers who can come out and provide an OBLIGATION FREE quote on the installation of SmartGrass. The weight of the sand and the rubber crumb act as an anchor to secure the grass down (approximately 15kgs per square metre). Adhesive tape is used to join the seams and 200mm nails pin the edges where the grass meets any concrete edges. How long will SmartGrass last? SmartGrass turf carries a 7 year limited warranty against excessive fading, wear and sun damage. However, expect in excess of 20 years in a domestic situation. Does SmartGrass require any maintenance? Minimal maintenance is required. Depending on your application, just use a plastic rake or leaf blower to keep leaves and debris off the grass. Every 3-6 months, depending on traffic, the grass should be groomed professionally by one of our installers to extend the life of your grass. How does SmartGrass handle walking and wear & tear? SmartGrass has been designed and tested to withstand more than the usual wear & tear of everyday living. What about pets and SmartGrass? SmartGrass is an excellent solution to stop dogs from digging holes and will not be discoloured by their urine. Natural turf supports the growth of mould more than SmartGrass. Due to the porous backing, water seeps through and soaks into the ground quicker.